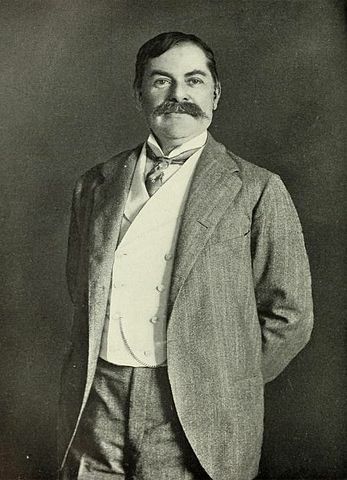 Thomas Nelson Page (1853-1922) was a lawyer and writer from one of the foremost plantation families of Virginia that lost most of its wealth and prominence after the American Civil War. Page studied and practiced law, but became disillusioned with the Southern legal system and gave up his practice. In his writing, Page popularized the Southern tradition of the plantation genre, as well as vivid portrayals of Confederate soldiers' experiences during the Civil War. The Burial of the Guns (1894) deals with the emotional reactions of the Confederate soldiers upon hearing the news of Lee's surrender at the Appomattox Court House. One of our favorites is his sentimental story about a retired Confederate officer, now a train conductor, How the Captain Made Christmas (1894) who talks of kindling romance and pride in one's origins on a memorable Christmas trip to New Orleans. Page served in President Woodrow Wilson's administration as the Ambassador to Italy, but resigned in 1919 after disagreement on Wilson's terms in the Treaty of Versailles. Page offers fine examples of literature in the genre of Realism. You may enjoy visitng another "page," American History offers other important authors and literature which helped shape America. The Gray Jacket of "No. 4"